"Not only do we cut between villains but we also cut between multiple protagonists." 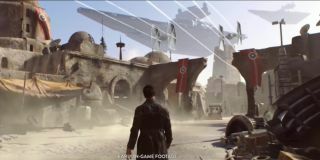 Following the reveal of Respawn's Jedi: Fallen Order, Amy Hennig has shared her reaction to the announcement of the newest Star Wars game. Hennig's own game based on the license was cancelled, as EA closed Visceral Games in October 2017. Speaking to Eurogamer, Hennig opens up about the Star Wars project she joined Visceral to create—codenamed 'Ragtag'— and how it was inspired by the original Star Wars films. "I had to take what I'd figured out [for Uncharted] in terms of deconstructing pulp adventure, and say alright, Star Wars is also in that category, but it has certain things that are distinct, or at least distinct from our core inspiration which was of course Indiana Jones." While she doesn't deny that it would have felt a lot like the Uncharted games, the game would have seen switches between different protagonists and villains. "Star Wars, not only do we cut between villains but we also cut between multiple protagonists," Hennig explains, talking about the direction Ragtag would've taken, had it been completed. "So you still go OK, Luke is the hero of the story, but when you look at Han and Leia they're co-protagonists. And then you look at Rogue One, the animated show Rebels, those are ensemble stories. That's the Star Wars DNA, right?" "But we were going to need playable characters in parallel sequences," Hennig adds, "because that's how Star Wars works. You only accomplish your goals by working together or working in parallel or both. We would always point to the Death Star escape as the prime example of that." Hennig has also commented on the tweet put out by EA Star Wars, which seemed to backtrack on the factors that apparently led to Ragtag's demise. "[It's] odd!" said Hennig. "I have to be candid with you. I mean, it's coming from the EA Star Wars Twitter handle, so it's certainly part of the plan, but I don't know whether it's implicitly referencing previous comments they made after our project was killed?" She goes on to say that "Respawn's game has the benefit of being largely developed before they were acquired," which isn't a position that Ragtag could claim before it was ultimately scrapped. She also speculates that the shift in attitude could be down to changing management at EA. "Obviously it's disappointing not to be able to share the game we were developing because I think it was really cool and pretty compelling," says Hennig.